From what I've read, hops appear to be sensitive to the right amount of moisture in the soil. They need a lot of water, but the soil should dry out between waterings to avoid root rot. To help determine a proper watering schedule, I purchased an inexpensive Soil Moisture Meter (use link on right to purchase from Amazon). So far, it seems to work pretty well. I should have the drip irrigation system setup this weekend to automate the watering (use link on right to purchase from Amazon). 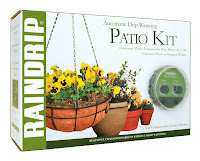 I used it last year to keep the plants and flowers watered on the back patio and it worked great. No more dead plants after going away for the weekend or having to ask the neighbors to water the plants when we went on vacation. It should work great for the hop pots.